Quad unveils Elite QSP stereo power amp to replace 909 | What Hi-Fi? 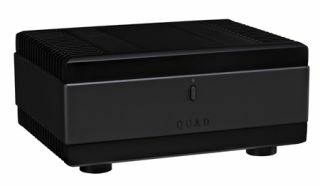 Quad's new Elite QSP (Quad Stereo Power) amplifier replaces the 909 in the company's range, building on its predecessor's blueprint with upgraded internal components and new circuitry. A key part of the design is Quad's proprietary Current Dumping technology, originally devised in the 1970s by Quad's founder Peter Walker. Current Dumping is essentially a combination of two stereo amplifiers: a low-power Class A amp provides the signal quality, while a high-power current dumping section delivers the muscle to keep the speakers under control. "Audiophile-grade components have been selected from around the world for their exceptional sonic ability," says Quad, "and the signal path is kept as simple as possible." New circuitboard layouts, screened signal paths, custom-made transformers and shielding to protect the amplifier boards from hum are all part of the new design. Although similar in looks to the outgoing 909, the aluminium casing has been redesigned to allow more efficient heat flow. Power output is 140W per channel into 8 ohms. The Quad Elite QSP will be available in the UK this month for £1195.95.